IN THE LEDGE – Will Kamloops-South Thompson be rural or urban under PR? Debate between Kamloops-South Thompson MLA Todd Stone and Premier John Horgan during Question Period on Monday, Nov. 19, 2018. T. Stone: There remain dozens of details that have been left unanswered to this point in this rushed sham of a referendum, and these details really matter. These are details that will inform how each of these proposed systems would actually translate votes into representation. These are details that would actually inform how many members would actually be sitting in this chamber and how many would be elected under a first-past-the-post component of a system and how many would be appointed off of party lists. These details matter because they will inform how vacant seats will be filled in this chamber. I’d like to give the Premier another opportunity to perhaps shed a little bit more light on a few of the other unanswered questions. Maybe he can provide us with what his direction will be on these items. In Kamloops–South Thompson, my constituents want to know this. To the Premier, in Kamloops and the surrounding area, how many MLAs will continue to be elected directly by local voters, and how many MLAs will be appointed off of party lists? Hon. J. Horgan: Maybe the questioner didn’t hear the question from the previous two questioners. We were talking about closed lists, which are anathema to certainly us on this side of the House and some members on that side of the House. So the answer is: all members will be elected by people to this region. No region will lose representation. There will be an upper limit on MLAs, and we will proceed from there. The people have an opportunity to decide. Thank goodness we’re not leaving it in the hands of the people over there, because one doesn’t know what the other one is even talking about. Mr. Speaker: Kamloops–South Thompson on a supplemental. T. Stone: Well, that’s not what it says in the Voter’s Guide. That’s not what it says, Mr. Premier. It clearly states in each of the proposed systems that 40 to 60 percent of the members of this House would actually be appointed off of party lists, not elected directly by local voters. Now, we know that the Premier is prone to changing the goalposts midstream in this referendum, which has happened on occasion, including just the other day. But he is absolutely wrong to suggest that local voters will elect all of the members to this chamber. Now, the Premier will dictate dozens of details after the referendum, details that will alter what actually happens to people’s votes, details like what defines an urban riding versus a rural riding? How many MLAs will actually sit in this chamber? How will vacant seats be filled? Will voters actually cast one vote or two votes on their ballot? 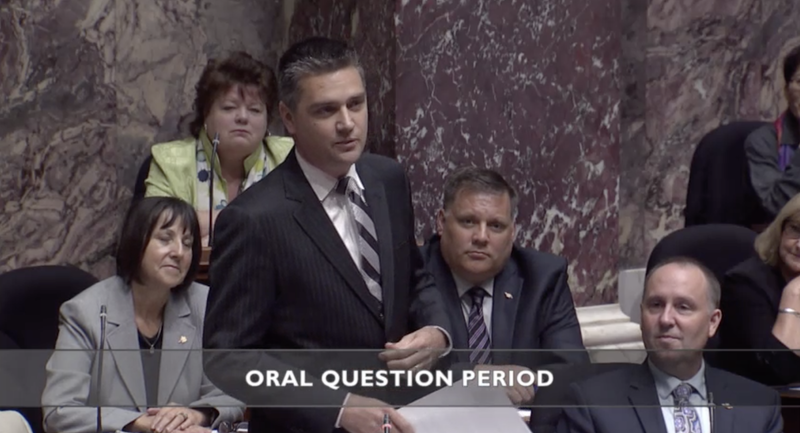 Mr. Speaker: Members, the member for Kamloops–South Thompson has the floor. T. Stone: Thank you, Mr. Speaker. The list goes on. The list goes on. And the Premier sits and says all of the time that the Electoral Boundaries Commission will determine all this. No, they won’t. The Electoral Boundaries Commission will determine the boundaries of the ridings once they’re informed by a legislative committee on all of the other details. T. Stone: It’s great that they take such pleasure in knowing that all of these details will be decided after the referendum and not before so that British Columbians can make an informed decision. My question, again, is a very simple question. It’s a basic detail that British Columbians should know as they’re voting in this referendum. That is this. To the Premier, how will a vacant seat be filled in this chamber under one of the forms of prop rep? And can the Premier please tell the people of Kamloops–South Thompson if their riding will be urban or rural under each of the prop rep systems? Hon. J. Horgan: Well, first the question misrepresents the Voter’s Guide, and then it goes into: “There’s not enough details. I need more details.” Now I’m supposed to determine before the people of British Columbia have exercised their choice how we’re going to fill vacancies. I don’t know if this is in reference to…. If this, hon. Speaker…. Hon. J. Horgan: Oh hey, wait for it, folks. Perhaps it’s because Jordan Bateman has said that if pro rep comes in, the Liberal party will come apart and there will be by-elections all over the place. So I can appreciate the member’s concern, because that member will go, that member will go, that member will go, and all of a sudden we’ll have a conservative party in British Columbia again without a shot being fired, as they say. Listen. I appreciate that those on that side of the House want to instill fear into the hearts of British Columbians that somehow proportional representation is a nefarious system that denies people rights. Dozens and dozens and dozens of countries have been using proportional representation for decades and decades, and the world still goes on. The sun comes up. Progressive governments are elected. They do good deeds for their citizens. That’s exactly what will happen here. I appreciate that those on that side of the House will now have to work with other people. Now, there’s a challenge. But we’re figuring out that it’s okay. We can work with anybody. I’m even working with Liberals by joining them in saying no to closed lists. 2 Comments on IN THE LEDGE – Will Kamloops-South Thompson be rural or urban under PR? Stone is starting to sound like his federal counterpart Cathy, and his provincial partner, Milobar. Pathetic. I don’t care if the boundary moves or if my riding gets a bit bigger—I’d rather have an MLA based a bit further away from me than have one who lives next door but always votes with a party I don’t agree with.